I certainly have been enjoying a lot of BLTs these days with all of the beautiful local, field ripened beefsteak tomatoes around! 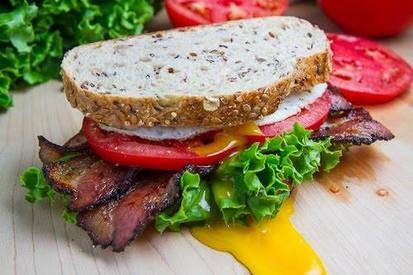 It can sometimes be difficult to imagine improving on an already amazing sandwich like the BLT, but adding an egg is a good place to start! There are a lot of ways to add an egg to a BLT but the first thought that comes to my mind is in the form of a quick and easy egg salad made with creamy mayo and a touch of a tangy mustard. I guess that once you add egg to the mix it is no longer a BLT but it becomes a BELT sandwich! Of course an even easier way to add an egg to a BLT is to simply add a fried egg and with that runny yolk it is very hard to resist!